The woman dusted off the suitcase before unclasping the fasteners. It had been a while since the container had been opened and so it was a struggle to wrestle it open, the clasps eventually giving up but not before leaving her a painful reminder of this tussle with a spiteful bite of her finger. The suitcase fell to the floor and all of her Arsenal memorabilia spilled out, almost as if the suitcase had been startled and in a panic, spat out its contents. All across the floor were her assorted home and away jerseys, scarves, programmes and a horde of photos from more memorable moments of being a Gooner. Now though, it couldn’t be more different. It wasn’t a trophy drought which had bred apathy from the ardent Gooner fandom. It couldn’t be further from the truth though, as Arsenal had entered into the affluent football period with an already healthy bank balance and a massive global following. No, the Gunners had amassed a decent amount of silverware and were a presence on all fronts. 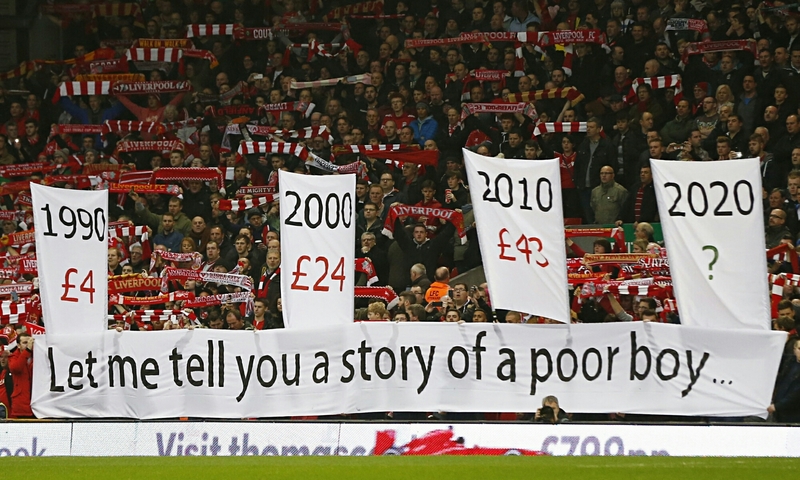 The reason the stadium was filled with people who could give less of a damn was the clubs obsession with money. The home of the club which she still adored but from afar had even changed name to the ‘ Coke Adidas Starbucks HSBC Colgate O2 Whiskas ‘ Stadium, or ‘ Cashcow Stadium’ for short. Sponsorship deals now garnered as many paragraphs in the media as transfer deals. Money was pouring into the coffers, but this didn’t mean a break for the fans. The majority of clubs back then had foreign investors, and clubs began to trade as more of a business, thus losing their sense of community and forgetting the service they gave to the working public on a weekend. Twenty years ago, ticket prices hit a watershed moment and mass walkouts during games affected the whole country. Protests staged before, during and after games. Slowly but surely, the majority of supporters were being strangled for money and their attendance was compromised. Eventually, the protests which involved perhaps a quarter of the match-going attendance grew and tens of thousands whipped up hysteria before every game. Whilst the real supporters of clubs were outside balking at ticket prices in which they simply couldn’t afford, the stadiums were still filled. This watershed moment hit and it was the realisation from the business-heads at every club that no matter if the ‘lifeblood’ of the club abated from spending money in the club shop or even stopped coming to matches altogether – the business would still thrive. TV deals, sponsorships and the fact that the stadium would still be filled with ‘fans’ meant that the business plan could continue. Fans were no longer to be sweetened. Clubs could look to profit margins as a sign of progress. Bank balances would swell and so would the pockets of shareholders. Meanwhile, the games were played out in near silence. Smatterings of applause when goals were scored – by either team – were the only indicator that spectators were present. It was so far removed from what a football match was meant to be. Blood and thunder. Screaming so hard that spots appear in your vision. Shouting so much that it sounds like you were gargling razorblades. Hugging strangers when the ball hits the back of the net. Highs that you thought you could never reach again, only for it to happen again the next game. Lows that left you unable to muster even the most basic of conversations. A heady cocktail of emotions that was perhaps the most intoxicating and downright addictive mixture that you would chase to the ends of the earth. She missed it, by god she missed it. She knew she wasn’t alone though. The fans hadn’t disbanded after being priced out of attending games. TV deals being so outlandish meant that there was always ways to follow your team. Supporters groups became more tightknit and the fact that all fans had been treated so badly by their clubs meant that the camaraderie was perhaps nearing matchday levels. It had been many seasons since games were spectated by regular fans. Today, as she donned her favourite jersey and wrapped her lucky scarf around her neck, the clubs would stop and listen. They all met at a locale near the ground. Up and down the country, supporters clubs had liaised with each other and arranged to protest at the sane time. This wouldn’t be a regular protest however. Clubs didn’t expect supporters to be able to afford a matchday ticket and thus, with the mild-mannered and hushed home fans making up the crowd, security had been toned down for many years. Even derby games were reduced to slightly faster clapping than usual. It was enough to make any fan cry with frustration. The fact that security had been lessened meant that with the amount of planning that had gone into this demonstration, it should go without a hitch. They all had tickets, but it had required the mother of all collections from supporters all around the world. Those that had been spurned by the club that they adore. This was billed as the time that the fans get back the club that had given them so many memories. The money wasn’t an issue after the plan had been told. Now, they were going through the turnstiles. Not all at once, as the civilised soulless masses which make up the current fanbase would never turn up to the ground like this. So, in drips and drabs, they all entered the stadium. The Cashcow stadium. She took to her seat in the Clock End and endured the endless adverts that were placed on the jumbotron. The atmosphere was so devoid of any electric that it contrasted from her memories of the past, but she was tingling. She couldn’t wait to start the protest. All they were waiting for was a goal. In recent years, a goal meant that applause broke the silence. You couldn’t even describe it as hearty. It was cold, it was perfunctory. Today though, would be different. Sure enough, in the first half, Arsenal broke the deadlock. From all corners of the stadium, deafening noise. Shouts of ” We Love You Arsenal ” rang around the ground. The players on the pitch wheeled around in utter shock. The fans who had arranged this had made up about seventy percent of the crowd and they began to jump and sing. Whilst it strained the eardrums with its noise, it also was perhaps the most uplifting moment this stadium had seen in some time. The players all began to clap and salute this effort. The noise didn’t stop. It didn’t slowly die out. For ten minutes, the fans clapped until their palms were sore. They shouted and sang until their voices strained with the effort. They let themselves loose and enjoyed every second. This wouldn’t change anything, not right away. But it was a message. This message, thanks to the location of its delivery, meant that it couldn’t be ignored by the club hierarchy. It was a reminder that the fans – the real fans – could make a difference, and they weren’t going away. Fans the world over had come together to stage this and it was only the first stage. Arsenal and the rest of the clubs that comprised the Premier League would now know that their money-grabbing ways wouldn’t be tolerated any longer. This was the start.